Arctic sea ice extent declined at a rapid pace through the first half of July, and is now tracking below the year 2007, which saw the record minimum September extent. The rapid decline in the past few weeks is related to persistent above-average temperatures and an early start to melt. Snow cover over Northern Eurasia was especially low in May and June, continuing the pattern seen in April. As of July 17, 2011, Arctic sea ice extent was 7.56 million square kilometers (2.92 million square miles), 2.24 million square kilometers (865,000 square miles) below the 1979 to 2000 average. Sea ice is particularly low in the Barents, Kara, and Laptev Seas (the far northern Atlantic region), Hudson Bay and Baffin Bay. Arctic sea ice extent declined rapidly through the first two weeks of July, at a rate averaging nearly 120,000 square kilometers (46,000 square miles) per day. Ice extent is now tracking below the year 2007, which saw the record minimum September extent. During the first half of July, a high-pressure cell persisted over the northern Beaufort Sea, as it did in June, and is linked to the above-average air temperatures over much of the Arctic Ocean. To date in July, air temperatures over the North Pole (at the 925 millibar level, or roughly 1,000 meters or 3,000 feet above the surface) were 6 to 8 degrees Celsius (11 to 14 degrees Fahrenheit) higher than normal, while temperatures along the coasts of the Laptev and East Siberian seas were 3 to 5 degrees Celsius (5 to 9 degrees Fahrenheit) higher than average. By contrast, temperatures through the first half of July over the Kara Sea have been 2 to 5 degrees Celsius (4 to 9 degrees Fahrenheit) lower than average. The sea ice extent data that NSIDC uses come from the Special Sensor Microwave Imager/Sounder (SSMIS) on U.S. Department of Defense satellites. Data from other satellites, while not as useful for studying long-term trends, can show more detail about ice cover in particular regions. Currently data from two NASA satellite sensors, the Moderate Resolution Imaging Spectroradiometer (MODIS) and Advanced Microwave Scanning Radiometer for EOS (AMSR-E), show areas of low ice concentration north of Alaska. Ice in these areas is likely to melt out in coming weeks. Both the Northwest Passage (through the channels of the Canadian Arctic Islands) and the Northern Sea Route (along the Siberian coast) are still choked with ice. Figure 4. This map shows the difference between average date of melt onset, when ice melt starts, and the date of melt onset this year. Red indicates earlier than normal melt, blue shows later than normal melt. The darkest red is an anomaly of 50 days early or more. White areas show no anomaly, that is they melted no earlier or later than normal. The gray area over the North Pole indicates where no data are available.—Credit: NSIDC, data from Jeffrey Miller and Thorsten Markus, NASA GSFC. When sea ice starts to melt in spring, small ponds known as melt ponds form on its surface. The small pools create a darker surface (a lower albedo) that fosters further melt. 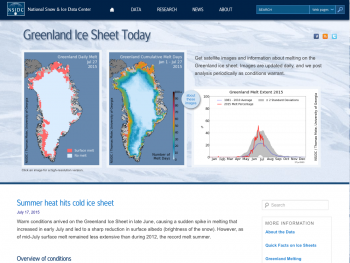 How early sea ice melt starts is one indicator of how much the ice will melt in a given year. New research by Don Perovich and colleagues shows that an early start to sea ice melt increases the total amount of sunlight absorbed through the melt season. Data processed by researchers Thorsten Markus and Jeffrey Miller at the NASA Goddard Space Flight Center reveal that melt began earlier than normal in both the Chukchi Sea, just north of the Bering Strait, and the Barents, Kara, and Laptev seas. Surface melting on the sea ice began from two weeks to two months earlier than the 1979 to 2000 average in these areas. However, in Baffin Bay and Hudson Bay, a cool spring led to a later start for surface melt, especially in Hudson Bay. Subsequent warm conditions have nevertheless led to rapid ice melt. As noted in our May 4 post, snow cover in central Russia retreated early in response to warm conditions this spring. Updated analyses provided by the Global Snow Cover Lab at Rutgers University reveal that snow cover remained very low for May and June. Even though some mountain regions in the U.S. and Canada saw greater-than-normal snow cover, snow cover for the Northern Hemisphere as a whole for May and June was the second lowest since the start of snow cover records in 1966. According to David Robinson, head of the Rutgers Snow Cover Lab, a new pattern is emerging in which the Northern Hemisphere is cloaked in above-average snow during late autumn, winter, and early spring, followed by rapid melt and retreat in May and June. While snow cover varies from year to year, the far north has seen a clear trend towards less spring snow cover over the last thirty years. Further ReadingThe July report of the ARCUS Sea Ice Outlook is now available . The report, compiled from sixteen international groups of sea ice scientists and others, predicts that September sea ice extent will fall well below the average for the month. However, only three of the sixteen predictions call for a September extent that breaks the 2007 record. 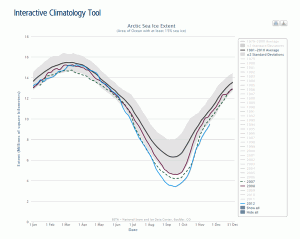 Do you have questions about the upcoming Arctic sea ice minimum extent? Read Heading towards the summer minimum ice extent, on NSIDC’s new Icelights: Your burning questions about ice and climate. Markus, T., J. C. Stroeve, and J. Miller. 2009 Recent changes in Arctic sea ice melt onset, freezeup, and melt season length, J. Geophys. Res., 114, C12024, doi:10.1029/2009JC005436. Ghatak, D., A. Frei, G. Gong, J. Stroeve, and D. Robinson. 2010. On the emergence of an Arctic amplification signal in terrestrial Arctic snow extent, J. Geophys. Res., 115, D24105, doi:10.1029/2010JD014007. Perovich, D.K., K.F. Jones, B. Light, H. Eicken, T. Markus, J. Stroeve, R. Lindsay. 2011. Solar partitioning in a changing Arctic sea-ice cover, Annals of Glaciology, 52(57), 192-196.